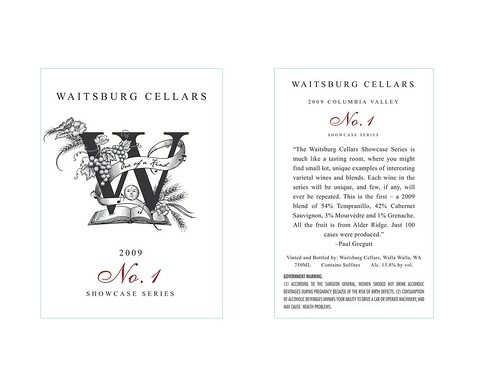 In other news, there will be a second Waitsburg Cellars red wine released this fall (the wine pictured above). The 2009 Showcase Series #1 is a blend of Cabernet Sauvignon and Tempranillo. This new line will provide a showcase for exceptional blends and single vineyard/single variety cuvées. Wine #1 is drinking beautifully and a perfect wine to make the transition to autumn. Check with our Seattle distributor (Unique) for further details. This past weekend I had the pleasure of participating in a very fine tasting of sparkling wines from Franciacorta, in the Lombardy region of Italy. This was done live via Twitter, with the six wines shipped out in advance. I invited several friends to join me, and between the live audience, the barrage of tweets, and my own scribbles, it made for a really entertaining couple of hours. There were some real gems among the wines, which were all made in the Champagne method, using traditional grapes. I don’t know that I’ve had many wines from this region before, and they are more expensive than most Italian sparklers, but in terms of QPR, they stack up well against true Champagnes. In particular I would recommend Gussalli Beretta’s Lo Sparvière Satèn, 100% Chardonnay, 20% barrel-fermented, and bespeckled with the most lovely, delicate bubbles. Apparently the word satèn in the local dialect refers to a lower pressure (frizzante) style. This wine, with a suggested list price of $25, goes right to the top of my personal list of great budget bubbly. Another highlight of the tasting was the Fratelli Berlucchi 2008 Brut Rosé, another steal at $27. Again, beautiful, tiny bubbles and a wine the color of a late summer sunset make your mouth water before the first sip, and the wine does not disappoint. Excellent length and balance, with complex details that suggest a lobster bisque accompaniment. The weekend brought other highlights, most notably a 1999 Columbia Winery Signature Series Red Willow Vineyard David Lake Milestone Merlot, pulled from my cellar when we decided to jump into something red after all the bubbly. Apart from having the longest name in the history of the world (ok, I’m just kidding) this wine was from a special vintage, and made by one of the people most important to me throughout my wine writing career, the late David Lake. I’m happy to say that the wine was spectacular, and my friends, who were poured the first glasses blind, went into paroxysms of praise trying to identify it. At 14 years of age, this drank like a third growth Bordeaux – not a bad comp. David Lake and Mike Sauer, the owner of Red Willow, collaborated for decades and were responsible for many of the first plantings of both Bordeaux and Rhône varieties here in Washington. This wine included 19% Cabernet Franc and 1% Malbec in the blend, perhaps the first in the state to explore such a mix. We sipped slowly and gratefully, and raised our glasses skyward repeatedly in a long series of toasts to David Lake. Bravo!! Your wines are excellent. I was excited as hell when I opened my Wine Spectator issue last week and read the reviews. Cheers!! Thank you Bill. It's been quite interesting finding myself on the other side of the reviewing fence, and certainly very satisfying to see so many positive scores and notes from other critics.